To find the remainder of a number divided by 3, add the digits of the number and divide it by 3. So if the digits added together equal 8 then the number has a remainder of 2 since 8 divided by 3 has a remainder of 2. For example, find the remainder on dividing 1,342,568 by 3. The digit sum of 1342568 is 1+3+4+2+5+6+8 = 29. So, the remainder will be 2. The digit sum of the number is 3+4+2+5+9+6+7+7+8+5+8 = 64. Now, the digit sum of 64 is 6+4 = 10 = 1. So, the remainder is 1. Similarly, the digit sum of 54,670,329,845 is 53 i.e. (5+3=) 8. When we divide 8 by 3, we get remainder 2. So the answer will be 2. To find the remainder of a number divided by 4, take the remainder of the last 2 digits. So if the last 2-digits are 13 then the number has a remainder of 1 since 13 divided by 4 has a remainder of 1. To find the remainder of a number divided by 5, simply use the last digit. If it is greater than 5, subtract 5 for the remainder. Split the digits of the number in group of 3 starting from unit’s place. Add the alternate group and then find their difference. 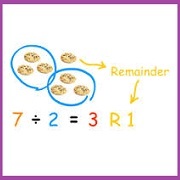 Divide the difference by 7 and get the remainder. Now alternate sum = 34+276=310 and 568 and difference of these sums =568-310=258. Divide it by 7 we get remainder as 6. Divide it by 7 we get remainder as 4. To find the remainder of a number divided by 8, take the remainder of the last 3-digits. So if the last 3-digits are 013 then the number has a remainder of 5 since 13 divided by 8 has a remainder of 5. To find the remainder of a number divided by 9, add the digits and then divide it by 9. So if the digits added together equal 13 then the number has a remainder of 4 since 13 divided by 9 has a remainder of 4. To find the remainder of a number divided by 10 simply use the last digit. The difference of the sums of the alternate digits is the remainder after dividing by 11 if it is positive. If the number is negative add 11 to it to get the remainder. Take the number 34568276 for example. And difference of these sums =24-18=6. So, the remainder is 6. Split the digits of the number in group of 3 starting from unit’s place. Add the alternate group and then find their difference. Divide the difference by 13 and get the remainder. Consider the number 34568276; we have to calculate the reminder on dividing the number by 27 and 37. Another example for the clarification of the rule; take the number 2387850765.
sum of the triplets = 2+387+850+765=2004. Dividing it by 27 we get remainder as 6. Dividing it by 37 we get remainder as 6.